DedicatedNOW Review 2019: Is DedicatedNOW a Good Hosting? DedicatedNOW has offered dedicated servers to clients around the world for over a decade. They offer customizable options that allow you to host almost any legal content. DedicatedNOW is a privately owned New Jersey-based company that’s offered online hosting services since 1997. They specialize in managed and unmanaged dedicated server hosting, and they have thousands of customers around the world. Any kind of legal adult content is allowed, so this is one for anyone in the adult entertainment industry to check out. These servers allow for customization of many features, including RAM, storage, and bandwidth. For extra fees, naturally. One thing that sets this company apart from others is that they will allow you to host legal adult content, so you don’t need to go underground with a dodgy “adult industry” provider that could be forced to shut down any time. Adult content or otherwise, if you’re going to use a dedicated server then you must know how to administer the server yourself. No auto-installers are available for this product, but the support team will help you install third-party applications as long as it takes less than 15 minutes. Customizable dedicated servers have 100% uptime and run over a Cisco redundant network. 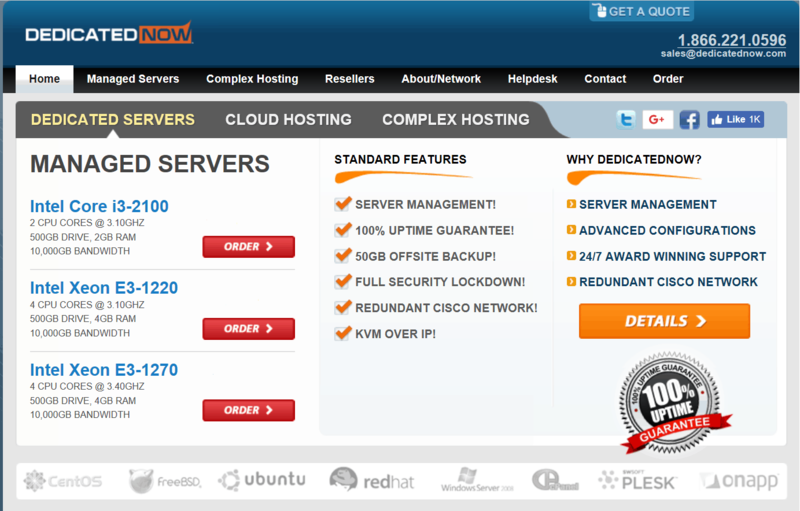 DedicatedNOW offers eight different server configurations, most featuring Intel Xeon processors. The pricing quoted on the website is for the very affordable base configurations that do not cater to your specific needs. You can check out the customization features on their website, or contact support directly for more information. The only real complaint I have about their servers is that all configurations are single-drive setups. I’d prefer them to offer some dual-drive setups as standard instead of forcing you to upgrade to get a second drive. DedicatedNOW offers excellent support for their dedicated servers in the form of 24/7 phone and ticket support. Unlike some services, they will help you with application support as well as hardware and general setup support. Their support is better than most, but live chat would be a nice addition. DedicatedNOW is an excellent choice for those looking for a reasonably priced dedicated server that is flexible regarding the types of legal content you can host. You don’t have to be in the adult entertainment industry to use DedicatedNOW, but if you are then you should definitely check them out. Wondering how DedicatedNOW stacks up against other Web Hosting companies? Enter any other Web Hosting company and we will give you a side-by-side comparison.